In recent years, camcorders are processing to a way of shooting videos with HD quality for example Canon ,Panasonic and Sony professional camcorders. The quality of videos is surely improved but a problem came out, that is the format of the videos. The format of those HD videos is MXF, which could not be edited by most editing software including FCP. If you happen to have a Canon XF300 or Panasonic AG-HPX370 which shooting videos in MXF and want to edit the videos by FCP on Mac, then what should you do? How to edit MXF videos in FCP in ProRes 422 MOV? To do this, you will need a Mac MXF to FCP Converter is designed for Mac users to convert MXF to FCP on Mac. With it, you can convert MXF to FCP recongnized formats like MP4, MOV, DV, HDV, etc. And this converter can keep the video quality during conversion with fast conversion speed. A variety of video output formats are supported like MKV, WMV, AVI, FLV, MPG, etc. Of course, some players are also supported like iPod, iPad, iPhone, PSP, etc. You are allowed to play converted MXF files on these portable devices. MXF to FCP Converter for Mac is really an awesome and efficient conversion software. Many multiple editing options enable you to set settings and make some editings before converting MXF to FCP on Mac, you can trim videos, merge videos, crop videos, add watermark, set video effect and so on. After convering MXF to FCP on Mac, you can import MXF to FCP for editing on Mac. Below is the simple step-by-step guide for camcorder and camera users about how to keep and maintain 1080/50 mbps or 100 mbps from Panasonic/Canon/Sony Camcorders to Apple ProRes or H.264/AVC MOV for FCP 6/7,FCP X on iMac/MacBook Pro with Mac OS X like Tiger, Leopard, Snow Leopard, Lion, Mountain Lion. Step 1. Add Panasonic/Canon/Sony MXF videos to MXF Converter for Mac. Connect your Panasonic, Sony, Canon MXF Camcorder to iMac with USB 2.0 cable or use card reader to transfer the P2 AVC-Intra, Canon XF .mxf files to Apple hard drive disk. Run MXF Video Converter for Mac as the best Mac MXF to editing software Converter, and click the “Add Files” button to load .mxf videos. This MXF Video Convetrer can convert Panasonic p2/Canon XF mxf export lossless compression video/audio compatible with Final Cut Pro 6/7/X on Mac. 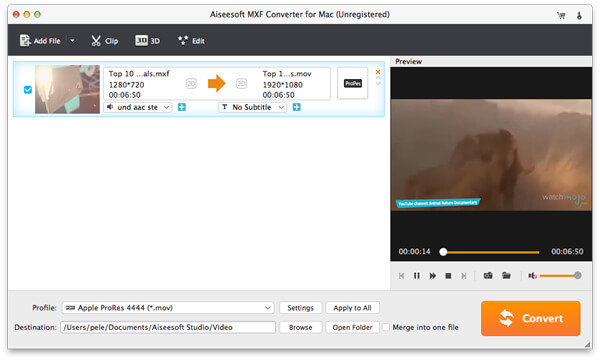 Select the files in the filelist and click Merge, and the Mac MXF Video Converter will join and combine the video clips into a single file as output. Step4. Convert MXF to ProRes 422 MOV for Final Cut Pro 6/7/X. Click the convert button under the preview window, the Mac MXF Video converter starts converting MXF videos to Apple ProRes 422 MOV, and joining the MXF files for editing in FCP 6/7 or FCP X. After converting and merging the MXF files, just import the output prores .mov files to Final Cut Pro 6/7 or Final Cut Pro X for editing. Optimize your workflow and save time with the prores 422 compression for Final Cut Pro 6/7/X. You can also import the output videos to Final Cut Express (FCE) 4 for editing in full HD. Tips: If you would like to edit Panasonic P2 AVC-Intra 50/100 MXF, Canon XF MXF with FCE/iMovie, Avid, Adobe Premiere Pro, After Effects, etc, you can convert MXF to Mac itself bring format like ProRes MOV for FCE and iMovie, or transcode to H.264 MOV, DV, AVI, M4V, MPG for Avid, Adobe Premiere Pro, After Effects on Mac.